First I have to talk about the label because labels are important. This label has very minimal information on it but it does say on the front of the label exactly what it is and the number of capsules which I listed above. The side has the supplement Facts which is 2 capsules. The other side has the suggest use which basically says take 2 capsules with your meals and store in a cool dry place. This side also reads "Enzymatic action to efficiently absorb nutrients by breakdown of proteins, carbohydrates, fats, sugars, lactose, cellulose." In my opinion I think that the label should have a little more information on it because it does have alot of information on the website that really intrigues me and would intrigue me even more on a label. Some of the information that I found really awesome on the website is that this is an all natural product (which is kind of mentioned on the label) also some other things are contains HCI, Non GMO product, work immediately, Full spectrum enzyme complex and 100% plant based. I just really like that information and I wish some of it was on the label. The actual product is about the size of my thumb nail, not big. My first thought was to smell the supplement which to my surprise actually smells like chocolate or a chocolate protein, that really made me want to take it. I just like the smell of chocolate! I took the supplement and it had no bad after taste, I really didn't experience an after taste at all with this product. I think this product would be great for someone who has stomach issues or issues with digestion as I had no stomach pains or side effects at all. 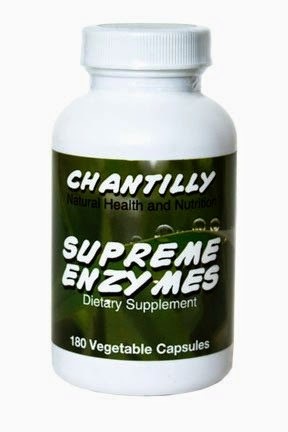 If you would like to check out Chantilly natural health and nutrition Supreme Enzymes it is on Amazon for $54.99 for 180 capsules.